Adriana Bäbler, MA, MPhil, DOMP, LMT, is the founder and director of Serendipity Birthing. She is a woman’s specialist who has supported, educated and empowered hundreds of women from preconception, through pregnancy and beyond. Adriana is an osteopathic manual practitioner and holds a Diploma in Osteopathic Manual Practice (DOMP). She has a special interest in using osteopathic manual treatment to address women’s health issues such as pelvic floor and bladder rehabilitation, chronic pelvic pain, pre and post-natal health needs, and fertility issues. Her approach combines osteopathic techniques, including craniosacral, myofascial and visceral, with self-care strategies to promote whole body health. Adriana also has a great interest in the treatment of infants and children using Cranial Osteopathic techniques. She is a certified doula through DONA International and trained with the world-renowned Penny Simkin. She is a certified Ayurvedic Postpartum Doula. Adriana also received training as a midwife assistant and holds a current Neonatal Resuscitation Program certification. She completed advanced training in lactation and is a certified Breastfeeding Specialist. As a yoga instructor she has over a thousand hours of teaching experience in therapeutic, fertility, prenatal and postpartum yoga and is the director of Serendipity Yoga's prenatal yoga teacher training. She is certified and registered with the National Yoga Alliance as an Experienced Registered Yoga Teacher and as a Prenatal Yoga and Children Yoga Teacher. Adriana is also a licensed massage therapist (LMT #MA77527), a certified Advanced Thai Massage Practitioner and Reiki Practitioner. In addition to her health and wellness work, Adriana has also held faculty positions at Johns Hopkins University, Rutgers University and The University of Delaware. Adriana speaks five languages and has lived in Europe, South America and the U.S. She now resides in Orlando with her husband and four boys. 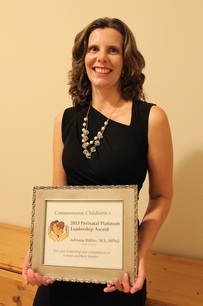 Adriana is honored to have been presented the 2013 Perinatal Platinum Leadership Award in Doula Category for her leadership and commitment to women and their families.